The Buick exhibit of Messrs. Mclntosh and Sons Ltd. was probably one of the most tastefully arranged in the recent motor show, held in Sydney. And as for service, one had but to step in to the Buick exhibit to have a suave, courteous attendant explain the many good points of the remarkable Buick Valve-in- Head motor car. We understand that there were quite a number of orders booked at the show, and we cannot help but feel that the courteous reception of visitors, the desire to please and to impart information, had quite a bit to do with the booking of these orders. NSW Buick Distributor – McIntosh and Sons Ltd.
Mr. Peter McIntosh, Governing Director of the firm of McIntosh and Sons Ltd., Sydney, is probably one of the most successful business men in Australia to-day. He is a man with over thirty years’ standing in the business world, and has the happy faculty of making a success of every line of endeavor into which he has entered. Commencing business in a small way, he soon sprang into prominence. 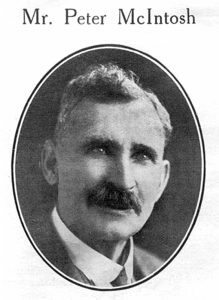 He is the founder of the Hamilton Flour Mills, at Hamilton, Newcastle, and also of P. McIntosh and Co., Quirindi, Universal Providers, and founders of the Quirindi Flour Mills. He is one of the principal organisers of the firm of Gillespie and McIntosh, flour miners, Inverell. He is the director in a large number of city warehouses, which are all successful concerns to-day. Mr. McIntosh’s first entry into the motor business was 1909, when he started a small shop in Market Street, and, since that time, it has grown, until to-day, when the firm of McIntosh and Sons Ltd. is probably one of the largest motor businesses in Australia. 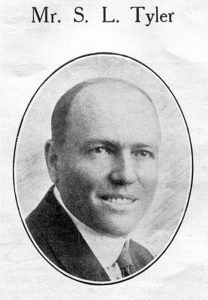 Of course, no small measure of Mr. McIntosh’s success in the motor business is due to the wonderful Buick Valve-in-Head Motor Car, but this does not detract from the fact that he was far-sighted enough to see the remarkable possibilities of this car in Australia. He has made several visits to the Buick factory in America, and knows just what this reliable car is doing in other portions of the world. As a matter of fact, there is scarcely a season goes by but what Mr. McIntosh, or a representative of his organisation, visits America, so that, at all times, the firm of Mclntosh and Sons Ltd. is thoroughly abreast of the times in the motor world. Mr. S. L. Tyler, managing director of the firm of Mclntosh and Sons Ltd., was born in Adelaide some forty years ago. He became interested in motors, in about 1902, went abroad in 1903, and finally settled in Sydney in 1907 in the motor trade. He became identified with the General Motor Co, of Sydney. now defunct, then with Davies and Fehon, importers of Ford and European cars. In 1913 Mr. Tyler took over the management of Mclntosh and Sons Ltd., later becoming a Director. He is ever active in the interests of his company, rarely missing a point to make of the firm of Mclntosh and Sons Ltd., one of the leaders in the automotive industry in Australia. He is also an energetic member of the Motor Traders’ Association – having, in 1914, become a member of the Committee. When, in 1915-16, embargoes were talked of by the Government, Mr. Tyler took great activity in protesting. His work, in this respect, was greatly appreciated by the motor traders, and he became a delegate to the Federal Convention, and was elected Vice-President of the Motor Traders’ Association. After two years, he became President of the Association, which position be now holds. Mr. Tyler was chairman of the recent motor show held in Sydney, and it speaks very well for his organising ability that the show was such a tremendous success. We feel that Mclntosh and Sons Ltd. are to be congratulated upon having on their executive staff a man of such sterling worth as Mr. S. L. Tyler has proven himself to be.